Wow…it doesn’t even list the BPS. Going to guess it’s a 300? My first was a Hayze 1200, then a Zoom 2400 and then a 14.4k. How far we’ve come. 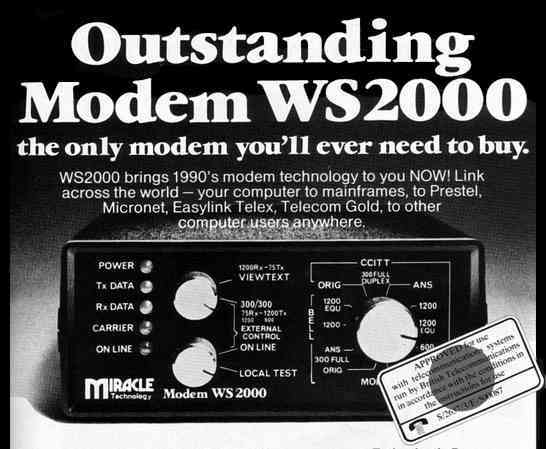 The “Miracle” of the WS2000 modem was the support for different flavours of V.21/Bell 103 (300 bps) and V.23 (1200/75 BPS), all made possible by the AM7910 “World Modem” chip. Quite a clever piece of equipment in the early 80s. The WS2000 was dumb, in so much as it did not support the Hayes command set. The same company later adopted the Rockwell modem chipset for V.22 and above in the Hayes compatible WS3000 model. In later years Miracle Technology was bought out by US Robotics.